In the wired world, to connect to the network you would plug in your Ethernet cable into the switch. In the wifi world, you must connect to the access point. The process of connecting to an access point is called the 802.11 State Machine. How does the station (STA) and access point agree to this connection? I’m going to attempt to break it down step-by-step on this post. The STA begins the process by performing a passive or active scan. In the passive mode, the STA is listening for beacons from an access point. 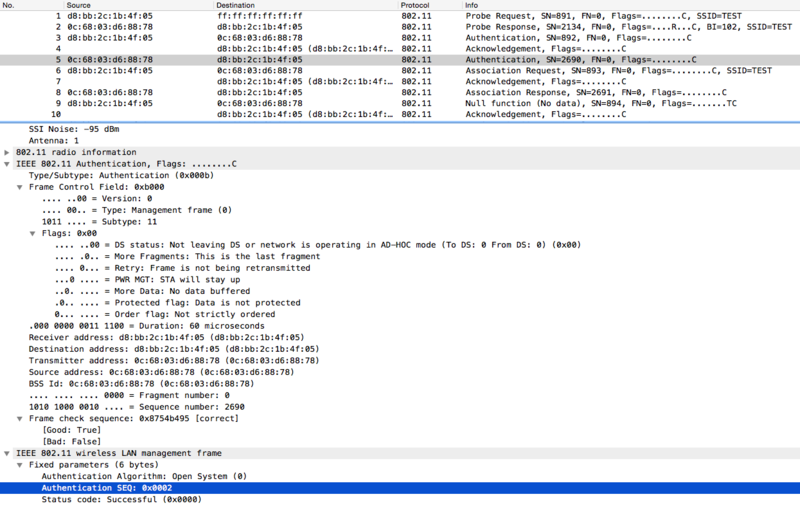 The beacon frame contains the BSSID which is the MAC address of the radio sourcing from the access point. 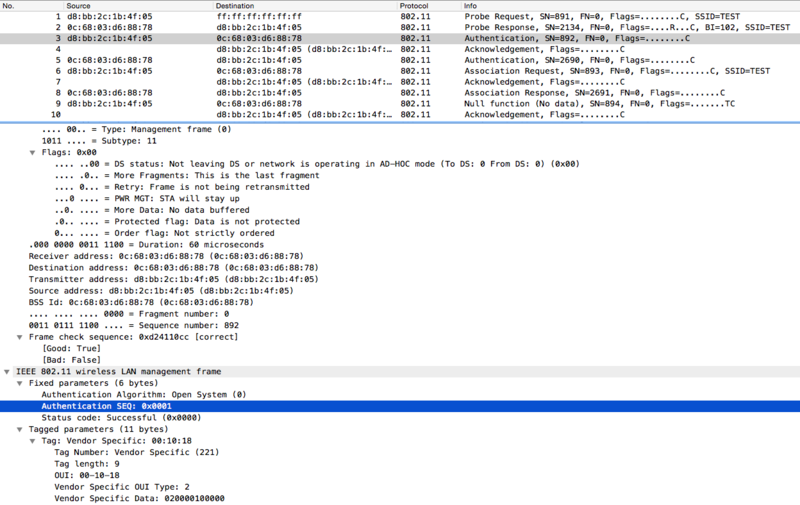 Wireshark capture of a beacon frame. The beacon frame is a type of management frame defined in 802.11-2007. It includes capability information and parameters. A probe is sourced from the STA requesting to join a wireless network. This is a probe request management frame. The probe is responded by an access point using a probe response management frame. In the probe request you will find the parameters as shown below. 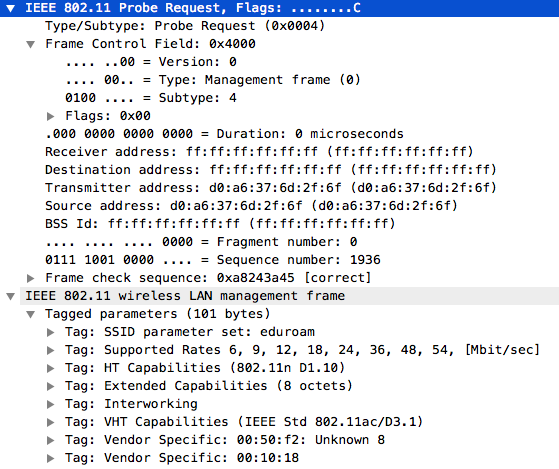 This is an example probe request from a STA broadcasted to any access point that can respond. The wireless network requested is eduroam. The probing/scanning phase is part of the unauthenticated and unassociated step. The STA has not authenticated with the access point and also is not associated with the access point. Think of authentication as plugging a computer into a port on a switch. The STA must be authenticated to the access point before it is associated. It sounds backwards. These are the two states in this phase and it must be done in this order. To begin the Authentication step, the STA sends an Authentication wireless management frame to the access point. The access point responds with an Acknowledgement frame. Notice above, the Authentication Sequence is set to a state of 1. The access point will acknowledge the Authentication frame from the STA and upon successful authentication, the access point will send an authentication frame to the STA with an Authentication Sequence with a State of 2, for success. Access point sends an Authentication frame with a state of 2, for Successful. If you noticed in the above successful authentication frame, the Authentication Algorithm was set to Open System. There are two types of methods for authentication. Open System performs no client verification. This is the method used with SSIDs utilizing WPA, WPA2, and those with no password. Shared Key uses a passphrase and contains a 4-way handshake for authentication. The STA sends a request to authenticate, access point receives the request and sends back a cleartext challenge, the STA encrypts and sends another authentication request based on the cleartext challenge and then the access point compares the STA’s challenge to the text. If successful, the STA is authenticated. Once the STA is authenticated to the access point, the next step is to become Associated. The Association occurs after the Shared Key Authentication or Open System Authentication Algorithm. There cannot be a STA that is Associated but not Authenticated. If the STA fails Authentication, it does not move to Association. After the the access point sends an Acknowledgement to the STA’s Authentication Response, the STA sends an Association Request. The Association Request is Acknowledged by the access point which then sends an Association Response frame to the STA. If the association is successful, the access point’s Association Response frame will contain a Status code: Successful. If the Status code is anything other than Successful, then the STA is deauthenticated. The example above uses a STA that is trying to connect to a wireless network for the first time. The SSID is called TEST and does not have a password set up. 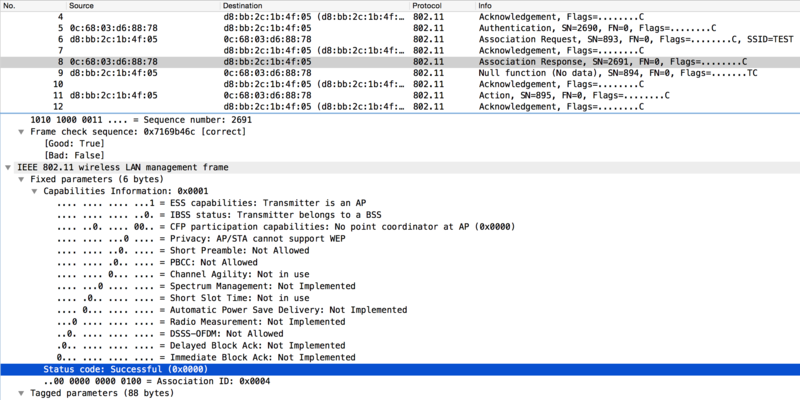 The STA probes for the SSID, moves into Authentication, transitions into Association, and is then successfully Authenticated and Associated. 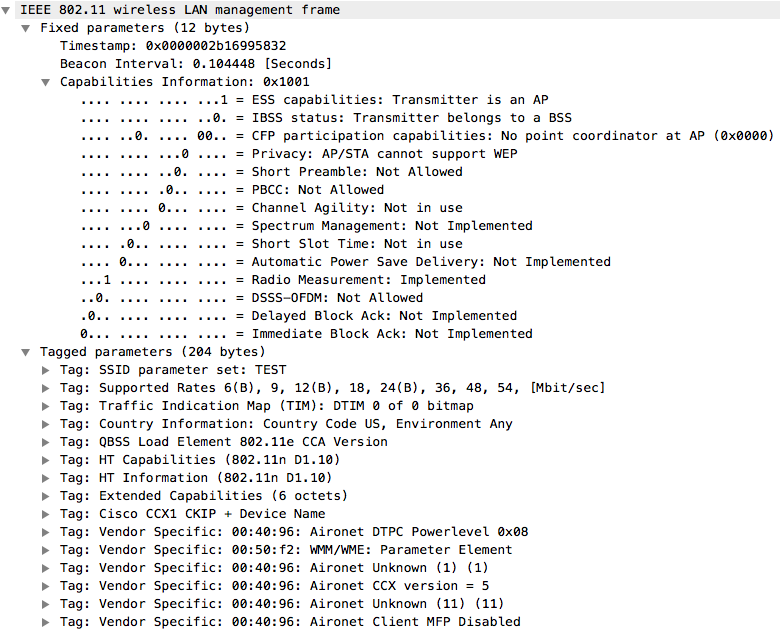 This last part indicates the STA can now send data wirelessly on the TEST network.